The HF2CA current amplifier converts 2 differential input currents to a differential output voltage, in a wide frequency range up to 100 MHz. This device is an active probe which can be conveniently placed close to the measurement setup. It supports applications with high capacitive loads such as dielectric impedance spectroscopy, where a large electrode-to-electrolyte capacitance needs to be measured at high frequencies. The dedicated design of the HF2CA insures stability and a smooth operation over the entire frequency range. The HF2CA ideally fits to the HF2 Series with its single connector providing both power supply and remote control, and it can be controlled by the same graphical user interface of all HF2 Instruments. The amplifier features 2 differential input and 2 single- ended output connectors. 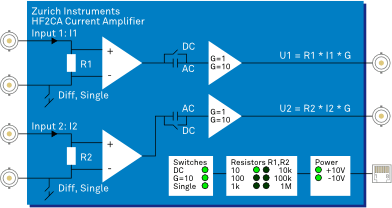 This permits to amplify differential and single-ended input signals, but also to combine both amplification paths into one differential output signal. For single-ended operation the negative input connector is switched either to amplifier ground internally or to an external ground provided by the application. This permits to use the amplifier in a large common mode range. The HF2CA is based on JFET input amplifiers which provide very low-noise over a wide frequency range. Additionally, the ultra-low input bias current of typically 2 pA allows for precise current measurements at small signal amplitudes. The HF2CA ideally fits to the HF2 Instruments with its single connector providing both power supply and remote control. The HF2CA is automatically detected by the HF2 Series instruments when it is connected and all settings can be controlled from the graphical user interface. Configurable settings include the input impedances (R1, R2), the output voltage gain (G), the switch for differential input operation (Single/Diff), and the DC coupling switch to prevent the propagation of 50/60 Hz noise.